The first acknowledged attempt at pressure cooking occurred in 1679 when French physicist, Denis Papin, who is most noted for his work with steam power, invented the “Steam Digester” in an effort to reduce the time needed to cook foods. This airtight cooking vessel used internal steam pressure to increase the boiling point of water, and as a consequence cooked foods faster. Over a hundred years after Papin’s discovery, in 1795, the French government offered a reward of 12,000 francs for anyone who could develop a method of preserving food supplies for the French armed forces. French confectioner Nicolas Appert took on the challenge and developed a canning process of packing food in clean jars sealed with a cork and cooking them in boiling water. This preservation method was accepted, and in 1809, Emperor Napoleon Bonaparte awarded Appert the prize money for inventing this basic canning process. Nicolas Appert then used his jackpot to open “The House of Appert,” the first commercial cannery in the world. These early discoveries, although crude, helped to develop the science of pressure cooking that we know today. Although pressure canning and pressure cooking are different methods, their history is so intertwined that you cannot have one without the other. By the early twentieth century, the pressure canning process had advanced, and in the United States, National Presto Industries (then known as Northwestern Steel and Iron Works) had become a major producer of 50-gallon industrial-size “canner retorts”. The hotel and institutions industry requested a 30-gallon size, and later a 10-gallon size was developed for home use. By 1917, the United States Department of Agriculture determined that pressure canning was the only safe method of preserving low-acid foods without risk of food poisoning. In kitchens across the country, homemakers were quickly discovering the many “dinnertime” benefits of high speed cooking in their pressure canners. Home pressure cooking, however, took a major step forward in 1938 when German Alfred Vischler introduced his “Flex-Seal Speed Cooker,” the first “saucepan-style” pressure cooker, at a New York City Trade Show. Although Vischler’s idea was on target, the product that caught the attention of homemakers was the “Presto” pressure cooker, unveiled at the 1939 New York World’s Fair. Women were thrilled with this modern saucepan-style pressure cooker because it featured an easy-to-close interlocking cover, eliminating the need for awkward lug nuts and clamps. 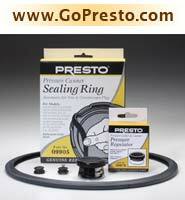 In the United States, “Presto” soon became the name synonymous with pressure cooking. The depression was over and stores could not keep up with the demand for them. By the end of 1941, pressure cookers ranked among the largest producers of housewares dollar volume in leading stores throughout the country. At that time, there were 11 companies manufacturing pressure cookers. Then, Pearl Harbor was bombed. World War II brought a temporary end to the manufacture of pressure cookers because aluminum was needed for the war effort. Food and fuel were being rationed along with many other necessities. The War Production Board made steel available for use in manufacturing Pressure Canners for the important victory garden and canning programs. Women were marching off to work in the defense plants and the pressure cooker was gaining more recognition because it made meal planning much easier. Sadly, there weren’t enough pressure cookers to go around, so neighbors and friends began sharing their cookers to get by until the war was over. The pent up demand for pressure cookers was tremendous at the close of the war. Up to 50 or more new manufacturers were trying to cash in on this cooking sensation, many were producing cheap, substandard cookers and selling them to unsuspecting consumers. In the 50s, the pressure cooker business moved forward with the introduction of stamped aluminum models for the budget minded homemaker and technological advances in the fabrication of stainless steel brought new lines of beautiful, long lasting stainless steel pressure cookers. But, by the late 50s, the bottom began to fall out of the pressure cooker business. The new manufacturers that emerged into this industry with inferior products and consumers that were using the cooker improperly were hurting the pressure cooker’s reputation, and its popularity began to wane. The 60s and 70s produced a multitude of new “fast food” cooking inventions, yet cooking a quick and healthy “real meal” remained elusive. While all this change was happening, only the reputable pressure cooker companies remained in business, continuing to improve their products and selling to faithful pressure cooker customers who had long understood the benefits of pressure cooking. In the mid 70s, pressure cookers took a key step forward with the development of additional safety features and new contemporary styling. An interlocking cover, that prevented the cooker from being opened unless pressure was safely reduced, and the addition of secondary overpressure devices eased the consumer’s resistance to pressure cooking. As the 80s progressed, cookbooks with new, modern recipes were being developed and pressure cookers, once again, were beginning to entice the interest of new consumers in the marketplace. The pressure cooker never lost favor in Europe or Asia. So, in the 90s, when the world market opened up, foreign manufacturers came roaring into the United States with many new styles and features, many in the “luxury model” category. The U.S. standard, however, continues to be the weighted valve regulator (or jiggle top). Virtually all of the products on the market today adhere to the basic safety and cooking fundamentals of pressure cooking established by independent testing organizations. In the United States, the pressure cooker’s popularity continues to quietly resurface because, no matter what style you choose, it is still the best choice for providing quick, healthy “real meals,” and so much more.